CCTV Camera Pros has been testing the use of power line Ethernet adapters as an alternative solution to wireless IP camera systems. For those that have never head of them before, power-line adapters allow standard electrical power outlets and cable to be used to connect devices to a network. The diagram in the picture below illustrates the setup. “In many cases we have found power line adapters to be more reliable than WIFI when connecting IP cameras to a network and they are certainly easier to setup. When it comes to indoor to outdoor communication, it is a no-brainer to use powerline Ethernet because most of the time that is not even possible to transmit a WIFI signal from indoors to outdoors.”, says Mike Haldas, CCTV Camera Pros co-founder. As most people know, wireless can suffer from interference and connection drops. There is also the more technical setup process that comes with setting up a wireless bridge between an IP camera and access point. Power line adapters provide a true plug and play setup experience. The installer simply connects one adapter to a power outlet, then runs a CAT5 cable from the adapter to a network router. 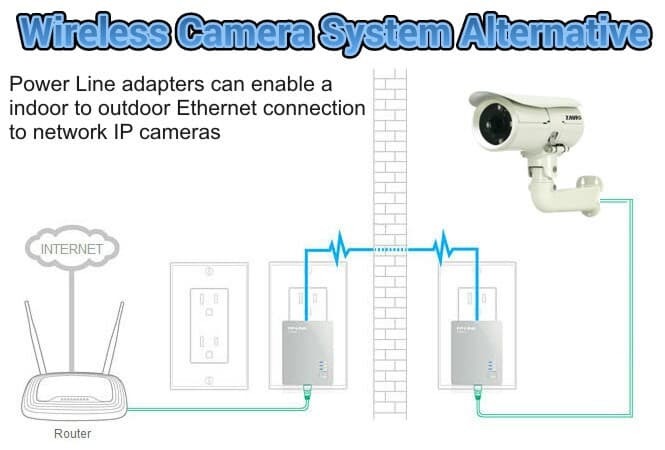 Then the installer connects the seconds adapter (two are included in a kit) to an IP camera and a power outlet near where the camera is located. That is all! Another benefit of power link adapters is they are very inexpensive. CCTV Camera Pros has standard and gigabit Ethernet kits starting at $59.99. Each kit includes two adapters. Click here for more information on power line adapters that CCTV Camera Pros has tested with network IP cameras.